Serving Well-Heeled San Franciscan Since 1934! Located on Upper Polk Street in San Francisco, our professional staff is eager to repair and restore your favorite shoes, boots - or any type of leather article. Store Hours - 7 Days Every Week! NEW: Shoe & Boot Repair Services Via Mailorder! We specialize in repairing shoes, as well as all types of boots for men and women, including Dress, Army, Cowboy, and Frye styles. Just call us before sending your repair items. Please download and print Mailorder Repair Form below. Our Quality Luggage Repair ~ Travel in Style With Your Luggage in Tip-Top Condition! No Job Too Big or Small! We replace or repair handles and wheels, and provide meticulous patching and re-stitching services. Stop in and visit us...we're eager to assist you! Join the Heel Club - Reheel 8 Pairs and the 9th Pair is Free! We have hundreds of repeat customers who love this complimentary service. Bring all your shoes in and save! A New & Convenient Spin-Off Service That Our Design-Conscious Customers Love: Fine Rug & Carpet Cleaning! We clean and freshen all types of area rugs and carpets, including Oriental, Persian, Turkish, as well as Modern and Vogue rugs. Call for details - or just bring your rug in, and we will provide a custom quote depending up its size, weave, and condition. Call Us or Visit Our Store! 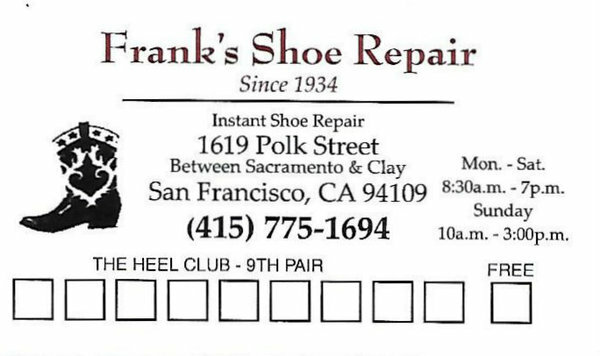 Praise for Frank's Shoe Repair on YouTube!